The owners of this property wanted to improve their existing patio space, part of a large garden which backed onto their converted barn with interesting architectural features. Set on a slight slope, the garden was accessed via the living room but didn’t meet the needs of the client, who wanted an extended space in which they could relax and entertain guests. 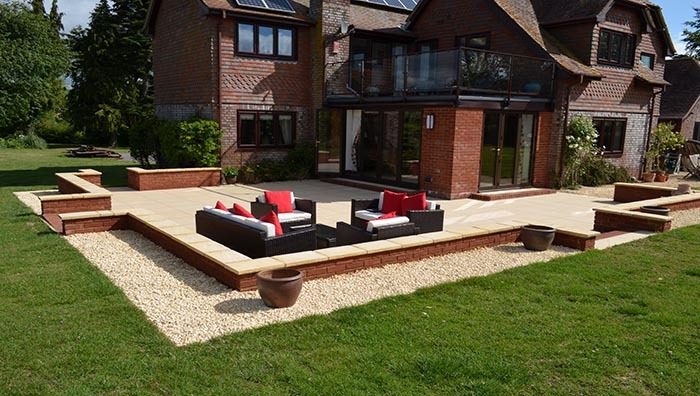 An existing gravel patio at the back of the house needed to be incorporated into the final design, which also needed to echo the red brick and timber construction of the property. 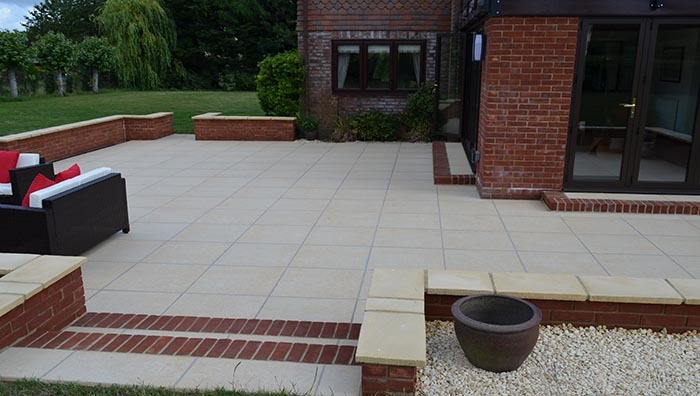 Finally, the clients were keen to have a patio which was low maintenance yet still looked stylish. Working with the architecture of the house, the construction team created a patio plan which wrapped around the corner of the property and linked the existing gravel patio to the rest of the garden. To make the most of the space, the team sank the patio level slightly to match the level of the French doors, and added a low red brick wall around the perimeter to provide privacy and separate the entertaining area from the rest of the lawn garden. Four entrances at strategic points around the patio were added to make it easy to get to from anywhere in the garden. For two of the entrances, shallow steps were built to work with the slope of the garden. A surrounding gravel border was laid to soften the contrast between lawn and patio, and to tie the design in with the original gravel area at the back of the house. The design team effectively used strong angles and lines to reflect the varied architecture of the house, without it intruding into the softer space of the rest of the garden. Using red brick alongside our warm Paleo Gold paving complements the rich colouring of the house itself, while judiciously placed rustic ceramics and urns nod to the traditional roots of the property. For this elegant design, the team used our Paleo paving for the main patio area. Paleo is a stylish, premium quality paving stone which comes in three colours: Sand, a neutral pale cream; Gold, a variegated and mottled warm buff; and Blawu, a crisp and cool grey-blue shade. Paleo Gold was used for this patio space and the rich under-tones of the colour shine through as a contrast to the red brick, especially on sunny days. Paleo is available in square or mixed formats, so it’s simple to create a stylish, minimal effect or a unique design using multiple sizes. It’s also a vitrified stone, making it an ideal choice for patios and other low-maintenance, high-use areas: it absorbs little or no water, so moss and algae don’t grow on the stones and they’re incredibly easy to clean. The final result is a bold, sophisticated space which has extended the clients’ entertaining area and looks perfectly at home against the unique architecture of the house. By using a combination of Paleo Gold paving and red brick alongside softer gravel textures, the design team have created a patio which links together the house, the existing patio and the garden with each element working in harmony with the others. The strong lines of the perimeter walls provide a visual contrast to the feathery planting of the garden while the creamy undertones of the Paleo Gold paving add warmth to the space. Importantly, the patio is also very practical without compromising on style. The four entrances, raised wall and easy-to-care-for paving choice mean the house’s owners can relax and entertain in luxury and privacy without worrying about high maintenance costs.